Update #1 (December 5, 2017): As some of you may have noticed, the People widget disappeared when we launched Gmail Add-ons. We apologize for any confusion this may have caused, and we’re committed to informing you of similar changes in the future. Please note that the People widget setting in Gmail has now been fully removed, and we’re working on a Gmail Add-on to replace much of the widget’s functionality. Stay tuned to the G Suite Updates Blog for more information on this Add-on when it launches. For many of us, email is mission control—the prompt to generate an invoice, prepare a presentation or follow up on a sales opportunity. With so many to-dos, imagine if you could complete these tasks directly from your inbox without interrupting your workflow. 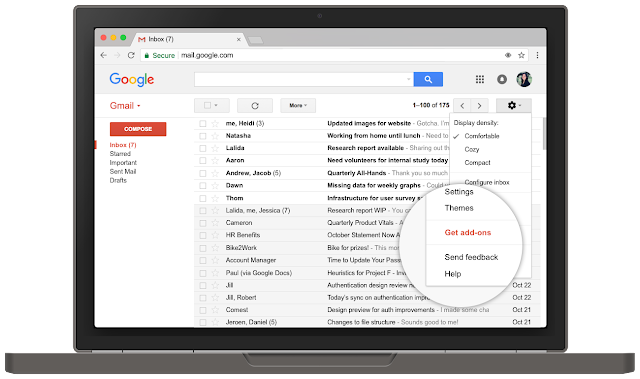 We believe email can do more, which is why we’re launching Gmail Add-ons, a new way to work with your favorite business apps directly in Gmail. G Suite admins can manage Gmail Add-ons the same way they do other G Suite Marketplace apps. For instance, they can turn off certain Gmail Add-ons, allow their users to install specific Gmail Add-ons only, or disable access to all G Suite Marketplace apps, including Gmail Add-ons. In addition, G Suite admins can set OAuth whitelisting controls, which Gmail Add-ons will respect. For more information, check out the Help Center article below. Update #2 (January 5, 2018): Gmail Add-ons now support domain-wide installation by G Suite administrators.